First off, I'd like to just say, this is an opinion piece. You can tell that because it is clearly marked in the opinion section. Editorials are fine and dandy, I'd just as soon report the news supplemented by my opinion on the straight reporting as to simply offer Dragnet style version of "just the facts, ma'am." Newswires like Agence Free Press, Reuters and Associated Press (AP) are some of the most respected sources for information about what is going on in the world. As a result, they should be held to some sort of standards. One of these long honored standards was keeping bias out of story reporting choice as well as steering clear of editorializing even in headline titles. Anyone who works for the AP must be mindful that opinions they express may damage the AP's reputation as an unbiased source of news. They must refrain from declaring their views on contentious public issues in any public forum, whether in Web logs, chat rooms, letters to the editor, petitions, bumper stickers or lapel buttons, and must not take part in demonstrations in support of causes or movements. This is odd considering AP published a fairly lengthy piece <a href="https://apnews.com/44045e8da6ad42f6a342a1f13b7b8f78">fraught with editorializing</a> accusing Fox News of bias and stating that the hosts of Fox and Friends, "have effectively become White House policy advisers." <a href="https://www.studentnewsdaily.com/example-of-media-bias/two-ap-news-stories/">Student News Daily points out</a> the media bias and editorializing of AP in tweet form. 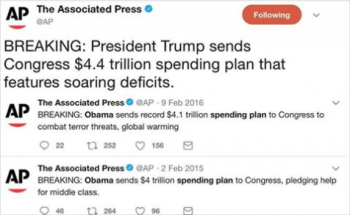 2015 and 2016, Associated Press announced Obama's $4.1 trillion spending plan showcasing how it was earmarked to "combat terror threats, global warming," and in another case how Obama's $4 trillion spending plan was part of his aim as far as "pledging to help the middle class." This sort of "bias by spin" is diametrically opposed to the lofty values that AP purports to hold itself to. To be fair, the bias cuts both ways evidently. <a href="https://www.opednews.com/articles/ANOTHER-EXAMPLE-OF-ASSOCIA-by-JOHN-LORENZ-080824-408.html">A pointed headline calling out Obama's "lack of confidence"</a> by Ron Fournier who, it turns out, happens to be a close friend of Bush confidant Karl Rove. OpEdNews.com points out this particular instance as well as another handful of examples of pro-Republican bias at AP by Liz Sidoti. I have a copy of the Washington Post Deskbook On Style from 1978. It explains how subtle editorializing can occur simply through word choice. Before you ask, yes, evidently long before the CIA bought a share of WaPo there was a time that at least lip service was paid to certain standards, for instance, this gem: "Connections with government are perhaps most objectionable." So the CIA having a controlling share is <i>technically</i> diametrically opposed to the "standards" of the Post. The Post deskbook also mentions how leaving out relevant information or including irrelevant information at the expense of what is relevant is an example of "unfairness" and bias in reporting. A good example of that would be, for example, that time the AP reported that a mass murderer yelled "God is great!" before wreaking havoc only to later explain he said it in Arabic. AP is evidently up to old tricks, in a recent "article" on the Trump/Kim Summit explains away the whole historic happening as two egomaniacs finding a way to convince the world to look at them. There may be an inkling of truth to this, but that in no way lessens the importance of opening the DMZ, denuclearization, reunification and the return of over 6,000 US soldiers who served in the Korean War.